with bowel mural masses, obstruction, and hemorrhage. The morphology of the clonal T cells is highly variable, with small cell, large cell, and mixed forms. The clinical course is typically short (13, 15–19). As noted earlier, a strict gluten-free diet implemented for ⬎5 years seems to eliminate the risk for these neoplasms (14). Other lesions associated with untreated CD include lymphocytic gastritis and lymphocytic colitis. 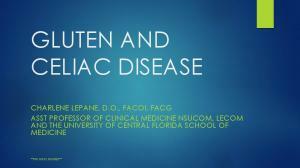 Although the prevalence of these two conditions in patients with newly diagnosed CD is as yet unclear, their development signifies a diffuse intestinal susceptibility to gluten-induced damage (20 –23). For example, in patients with CD and lymphocytic gastritis, the gastric mucosa will revert to or toward normal upon institution of a gluten-free diet (20). Another associated lesion is dermatitis herpetiformis (DH), a pruritic, papulovesicular skin lesion that is symmetrically distributed on scalp, buttocks, and extremities. It is characterized by a granular deposition of IgG at the epidermal– dermal junction. Most (70 –90%) of patients with DH will have a severe mucosal lesion on small-bowel biopsy; conversely, ~10% of patients with CD will develop DH at some point in their clinical course. The skin lesions resolve when the patient is placed on a gluten-free diet (1–3, 22, 24). Finally, some immune disorders appear to be associated with CD: selective IgA deficiency, insulin-dependent diabetes mellitus, Sjogren’s syndrome, and autoimmune thyroiditis (1–3, 25). FIGURE 2. Marsh Type III lesion. A, at low power, there is virtually complete villous blunting associated with crypt hyperplasia. B, at higher power, the increased number of surface intraepithelial lymphocytes and the damage to enterocytes are evident. Type 0: Normal mucosa; CD highly unlikely. Type 1 (Infiltrative lesion): Seen in patients on a gluten-free diet (suggesting minimal amounts of gliadin are being ingested); patients with DH; and family members of patients with CD. However, these patients need to be followed because they may convert to a Type 3 lesion. Type 2 (Hyperplastic type): Very rare; seen occasionally in DH. Type 3 (Destructive lesion): Spectrum of changes seen in symptomatic CD (38, 39). that villi overlying and adjacent to lymphoid nodules/follicles are normally blunted or absent, and such areas should not be chosen for analysis. All of these changes may be focal; therefore, a single biopsy may give false-negative results. Diagnostic yield is increased with a larger number of specimens (up to four). If only a single specimen is received, obtaining multiple levels may reveal areas of abnormal mucosa (39). As can be seen from this discussion, the histologic spectrum of changes in CD is as varied as the clinical presentation. These morphologic findings have been codified in a modification of Marsh’s original classification (39; Table 1) Refractory CD refers to the case of those patients considered to have CD who stop responding clinically and histologically to a gluten-free diet. Possible causes for refractory CD include the unrecognized intake of gluten, lack of adherence to a gluten-free diet, and the development of lymphoma (3). Patients who have never responded to a glutenfree diet most likely do not have CD (41). The pathologic features of refractory CD are not well defined; possible findings include the development of a thickened subepithelial collagen layer, mucosal thinning and subcryptal mononuclear inflammation, and evidence of lymphoma (19, 42). cases. Onset usually in the first 6 months after birth. Tropical sprue: lack of antiendomysial antibodies; response to antibiotic and folate therapy. Common variable immunodeficiency: paucity or absence of plasma cells; marked lymphoid nodular hyperplasia; Giardia infection common. Infectious (usually viral) enteritis: normal IEL counts. Food protein intolerance (eggs, cow milk, etc. ): increased eosinophils; other allergic manifestation (asthma, atopy); response to elimination diets. Development of lymphoma: atypical lymphoid infiltrate; high index of suspicion; imaging studies that demonstrate mass lesions. sensitive and specific screening method for celiac disease. Am J Gastroenterol 2001;96:1536 – 40. Tursi A, Brandimarte G, Giorgetti G, et al. Low prevalence of antigliadin and anti-endomysium antibodies in subclinical/silent celiac disease. Am J Gastroenterol 2001;96: 1507–10. Wahab PJ, Meyer JWR, Mulder CJJ. Histologic follow-up of people with celiac disease on a gluten-free diet: slow and incomplete recovery. Am J Clin Pathol 2002;118:459 – 63. 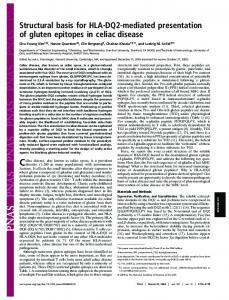 Corezza GR, Caletti GC, Lazzari R, et al. Scalloped duodenal folds in childhood celiac disease. Gastrointest Endosc 1993; 39:543–5. Bardella MT, Minoli G, Radaelli F, et al. Re-evaluation of duodenal endoscopic markers in the diagnosis of celiac disease. Gastrointest Endosc 2000;51:714 – 6. Shah VH, Rotterdam H, Kolter DP, et al. All that scallops is not celiac disease. Gastrointest Endosc 2000;51:717–20. Ravelli AM, Tobanelli P, Minelli L, et al. Endoscopic features of celiac disease in children. Gastrointest Endosc 2001;54: 736 – 42. Marsh MN, Crowe PT. Morphology of the mucosal lesion in gluten sensitivity. Baillieres Clin Gastroenterol 1995;9:273– 93. Oberhuber G, Granditsch G, Vogelsang H. The histopathology of coeliac disease: time for a standardized report scheme for pathologists. Eur J Gastroenterol Hepatol 1999;11:1185– 94. Goldstein NS, Underhill J. Morphologic features suggestive of gluten sensitivity in architecturally normal duodenal mucosal biopsies. Am J Clin Pathol 2001;116:63–71. Biagi F, Corazza GR. Defining gluten refractory enteropathy. Eur J Gastroenterol Hepatol 2001;13:561–5. Robert ME, Ament ME, Weinstein WM. The histologic spectrum and clinical outcome of refractory and unclassified sprue. Am J Surg Pathol 2000;24:676 – 87. Report "Celiac Disease: A Progress Report"